1.00pm – Reach home, shower and lunch. Sometimes milk too. 8.00pm – Sleep baby sleep…. Saturday is one of mommy’s busiest day. Ryan has Art class in the morning followed by Darren’s Kindermusik and Ryan’s swimming at 4pm. Come Sunday, it’s usually more relaxing. Basically it’s just chil and play all day for the kids if we opt to stay in. ** Ryan has E-nopi twice a week (45 mins each), Mandarin Lesson 3 times a week, Art Class once a week and Swimming once a week. Hectic? Hahahah I think so. I’m tired from the chauffering but he seem to enjoy every session of it. 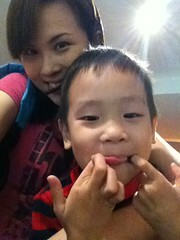 At times, when I threaten to pull him out of any of the class, he will show me the sour face and say ‘Mommy, ä½ ä¹±ä¹±åƒµåŒ– (Mommy, NÇ luÃ n luÃ n jiÄnghuÃ ). That seem to be his favourite phrase now when he wants to show his dissatisfaction at me. And yes, lately he’s been speaking a lot of Mandarin with everyone. I’m pretty impressed with his progress just 8 months after signing him up with BaoBei. Literally from zero to fluency now.Â Mommy isÂ so proud of you, baby. Last Tuesday Ryan was absent from school due to an eye infection. Since his infection was not serious, we decided to go ahead with our prebooked movie “Rio”. It proved to be a wise decision as the movie was so good that even the noisiest kid in the whole town (Ryan) could sit still throughout the show watching and listening intently. Double thumbs up. 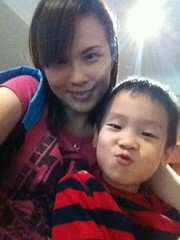 Some camwhoring outside Signature @ Gardens. We bought 2 tickets for 3 May 11.55am matinee show. We were the 2 out of 4 movie goers in the whole cinema. Love the bonding time.